A leader will help your organization steer through tough times; a good leader will have a plan in place to react quickly to change; a great leader will have course corrected long ago so that you will never know what dangers were in your path. In this session we will discuss the 9 key characteristics that great leaders employ every day in their quest for success. We will examine exceptional communication strategies, the elements to decisive action planning, when transparency works for you and even against you and how failing forward is good for the team. At the end of this interactive session, each participant will have new tools to use in identifying what habits, attitudes, beliefs and expectations are holding them back or propelling them forward. Crisis situations donʼt happen every day, but they do occur several times in every leaderʼs career. Sadly, when they happen they often take one by surprise, leaving a wake of destruction in their path. This dynamic workshop, Leading Through Crisis, will teach leaders how to recognize the warning signs of an oncoming crisis, create a defining moment, and then make their mark to avert catastrophe. Speaker Tammy J. Bond, The Team Optimizer, will discuss findings of work with leading executives and their teams crisis leadership. Many put their careers on the line to save their organization. Some succeeded, while many others failed. Nearly all of the crisis situations included the same three ingredients: hidden problems, entrenched interests and profound communication fail points. Tammy will detail what it takes to speak truth to power in these crisis situations, and the positive impacts speaking up can have on your organization and career. Learn what top leaders do every day to improve the health of their team and organization. Understand your primary communication driver and how core values affect your decision making. Tammy J. Bond is a dynamic facilitator that can turn your room on fire in the first 6 minutes! She motivates you to look at your problems differently and reflect the mirror on yourself for the solution. Powerful! We have all been there. In the middle of what we believe to be a good conversation, expressing "our side", giving “our input” and right before our eyes, something explodes. It leaves us wondering, "how did this happen?" The scenario is not uncommon. It happens in our relationships, it happens in our offices, on the phone and in email. Whether we are communicating verbally or in writing, a communication breakdown can happen at any moment. While good communication is an art form in and of itself, it is not as difficult as some believe it to be. In this interactive workshop Tammy J. Bond will show you how to develop a new strategy that not only supports good communication, but teaches you how to transform the way you communicate to move you from breakdown to breakthrough. You will learn 4 easy to implement steps to use in every interaction. Silos can arise in any firm, large or small, and are lethal to organizational success. Silos can occur in global corporations or start-up ventures with 15 employees. And no matter the size, they are detrimental to an organization’s ability to succeed in a rapidly changing world. A siloed organization cannot act quickly on opportunities that arise in a fast-paced business landscape, nor is it able to make productive decisions about how to change in order to seize these opportunities. 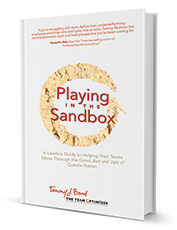 In this interactive discussion, Team Communication Expert Tammy Bond will reveal the 3 consequences to ignoring the Silos impacting your organizations ability to succeed. It seems that some people are just born to be difficult. We have all worked with them and most of us dislike them. Difficult people are easy to recognize — they show up late, leave early, don't turn their work in on time and have an excuse for every failing. But wait, there's more! These difficult people harass you and others, neglect details, distract you and repeatedly challenge you. These people use an average 32% of your time each week just managing to their issues. Even worse, they can and often do have a devastating impact to your customers and vendors. Their performance impacts the goals of not just the individual, but the entire team. In this robust workshop, Tammy J. Bond takes participants through some difficult, real life scenarios to get to the core what’s happening as you create a plan to stop the madness and destructive behavior. Learn how to handle the problem employee while protecting yourself with a proven 5 “I” process: 1. Ignore 2. Intervene 3. Indulge 4. Interview 5. Initiate At the end, you will have a plan to handle these problems and turn everyone around to improved performance while keeping your sanity intact. What does drive our sense of draining or gaining energy? In our life, a key to answering this question lies in understanding our beliefs; ones that energize us and ones that don’t. The Professional Energy Process (PEP) involves taking a moment to notice what we are thinking and feeling in a given situation. It can be helpful when looking back on a situation that didn’t turn out as hoped and discover the de-energizing belief. This process will also help imagine a new result by understanding the focus of attention and how that stimulates our awareness, habits of behavior and perception and our actions. In this interactive workshop, we will begin to look at our reactions from Habit and from our Situation as we begin to choose how our energy is applied. The process is straightforward and overtime can be mastered so that we are focusing on Gaining Energy in all key areas of life and business. Every day we are met with decisions and opportunities. Whether in business or personal life, we are met with the reality that we will impact our current situation either positively or negatively. In this workshop you will begin to gain understanding around how we make decisions and look at the opportunities we are presented with. And, we will uncover how our Mindset is the primary driver to every decision we make and every opportunity we encounter. Whether you embrace change or run the other direction. Whether you believe you are a positive partner to your colleagues and family, or go through life with a cloud over your head. Your success really comes from the way that you look at every situation you encounter. That is your Mindset. We will cover Attitudes, Avoidant Behaviors and Comfort Zones in this interactive workshop. In this large group presentation, we will embark upon a journey to discover the very steps and actions that you can take to more than just strengthen your business, Grow It! We will walk through the steps to support your transformation in life and business. As we examine our attitudes and behaviors, we open ourselves up to grow. This interactive journey through the 10 Steps to Strengthen and Grow will leave you with a clear map and action plan that will change the way you conduct business daily. In this action packed, interactive presentation, you will discover the 10 things to Strengthen and Grow you, your business and your teams. We will cover The Power of Your Word, Investing in Yourself, Forethought and Action Planning. You7 - You and your business living powerfully 7 days a week. In this dynamic workshop, we will uncover the steps you'll need to achieve and increase your personal power. We will begin to gain understanding around how we make decisions and look at the opportunities we are presented with. We will uncover how our Mindset is the primary driver to every decision we make and every opportunity we encounter. We will identify the seven power tips to begin to breakdown your limiting beliefs and build up your foundation for success. Participants will walk away with new tools to remove the barriers in their path in order to access their personal power, and chart their course to breakthrough success at every level.